San Diego Chargers running back Ryan Mathews celebrates his touchdown with teammates in a game against the Ravens on Sunday in Baltimore. UPDATE (Dec. 5, 2:45 p.m.): The interactive tables above have been updated to include the results of Thursday’s DAL-CHI match-up, and that game has been removed (the text of the article has not been updated). The San Diego Chargers’ playoff chances, once as high as 75 percent, were on the verge of dropping into single digits Sunday as the team trailed the Baltimore Ravens by three late in the game. Without Rivers’s clutch drive, the Chargers would have been 7-5 with just an 8 percent chance of making the playoffs. Instead, San Diego has a 36 percent probability and — with its 8-4 record — a claim on the top AFC wild card seed. That’s the good news for Chargers fans. The bad news is the Chargers have the most difficult remaining schedule in the NFL. Over the next four weeks, San Diego will face the New England Patriots and the Denver Broncos at home, and finish the season on the road against the San Francisco 49ers and the Kansas City Chiefs. The combined winning percentage of those four teams is 67 percent. The Chargers’ schedule is so difficult that there are three 7-5 AFC teams — the Miami Dolphins, Ravens and Chiefs — with a better shot at making the playoffs despite being a game behind San Diego. San Diego figures to be an underdog for the rest of the regular season, so it’ll need to pull off at least a couple of upsets to secure a playoff berth. If it manages such an upset Sunday when it hosts New England, its playoff chances will climb to 56 percent. A loss drops the Chargers to 24 percent. Sticking with the AFC, the most important game of Week 14 looks to be the matchup between the Ravens and Dolphins. This is largely a zero-sum battle, with the winner emerging with a 70 percent chance of making the playoffs and the loser dropping below 20 percent. The Buffalo Bills find themselves in the odd position of hoping for a Dolphins win to boost their meager playoff chances. 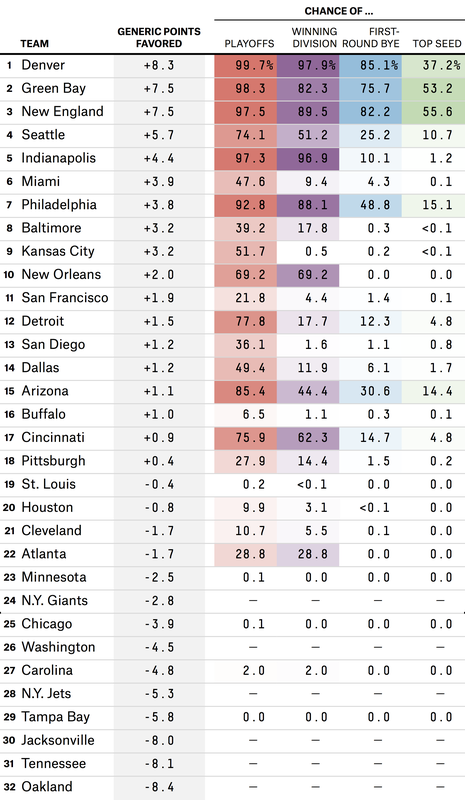 Similarly, the Cleveland Browns and Pittsburgh Steelers do better with a Ravens win (everything flips, of course, if we focus just on division-title probabilities). Things are quieter in the NFC; there are no high swing games. The most important NFC game may very well be Sunday afternoon’s contest between the Seattle Seahawks and the Philadelphia Eagles. 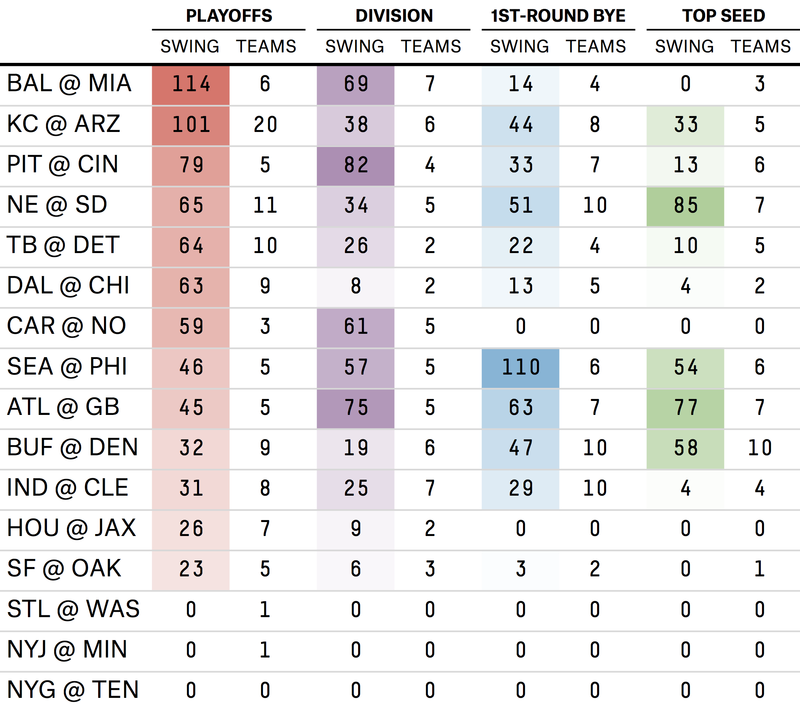 This game has a significant effect on each team’s chances of securing a first-round bye. The bye week is tantamount to a “free” playoff victory and greatly improves a team’s chances of making it to the Super Bowl. The AFC’s Gini coefficient, however, has stalled at 0.57, unchanged from last week. There were winners: the Dolphins, Chargers, Houston Texans, Bills and Cincinnati Bengals. And there were losers: the Ravens, Browns and Steelers. But the outcome seems just as uncertain as it was going into Week 13. We’ve added a new feature to this column. Use the interactive below to get a quick read on what games matter for every NFL team still in contention. A five-win NFC South champion no longer seems like a possibility. There is still, however, a 1.5 percent probability of a six-win champion. Grantland contributor Bill Barnwell laid out what he termed the “Nightmare Wild-Card Scenario” in his wrap up of Week 13. In this scenario, eight AFC teams finish with a 9-7 record, requiring an interminable application of tiebreakers to determine the fifth and sixth wild card seeds. In our simulations, this “nightmare” occurred 11 times (out of 50,000 trials), with the Chiefs and Texans being the most likely wild card teams to emerge from the tiebreaking process. There is a 5 percent probability that the Dallas Cowboys finish the season with an 8-8 record (and miss the playoffs). San Diego was aided by a defensive pass interference call in the end zone that put the ball on the 1-yard line. See our Week 12 feature for additional background on this concept.